Some people may think having a shoeshine is simply about improving or restoring the appearance of their shoes, but don’t you believe it. If Willie Riles, who has been bringing up the shine at Kelly Square in Sherman for 18 years, has ministered to their needs, they know that it is about something more, including a smile and an entertaining conversation. Riles is semi-retired now, but he has been a part of Kelly Square for so long that folks just won’t let him get too far away. Born in Mississippi, the only boy of five children, Riles began shining shoes at a time when his efforts brought in a nickel or a dime. The price has gone up, but other than that, there have not been too many changes in the shoe-shining business since then, except that many different types of shoes and myriad colors have now joined the black and brown. 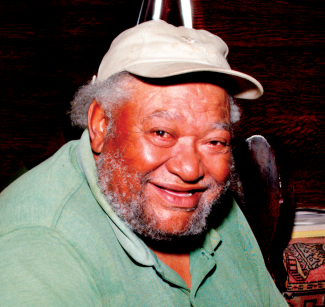 After leaving Mississippi in 1955, Willie lived in Los Angeles and New Orleans before settling in Sherman in 1989. He has been at Kelly Square ever since, much to the delight of his customers and coworkers. Overall, his customers have been generous or (at the very least) reciprocally amiable. Some stop by the stand regularly, others, like the fellow with a special affinity for the holidays, not so often. “He always comes on Christmas Eve. He only comes that one time of year to get that shoeshine, and he always gives me $105, every Christmas. He don’t miss it.” That’s five for the shine and a century note for a tip. 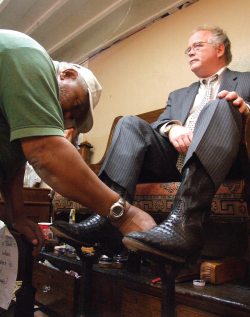 Riles has shined the shoes of many Texomans, friends and strangers alike, and most of the strangers become friends after a few visits. Lawyer Tommy Shea keeps his gator-skins in top shape with a pit stop at Riles stand. So if you’re in Sherman Monday through Friday, with a few minutes to spare, stop by Kelly Square and pass a few minutes with Willie Riles and his shines and smiles. It’s a wonderful way to start the day. For the time being, Willie Riles holds court at Kelly Square Monday through Friday. – Did you know that you can effectively shine your shoes with a banana peel? – The late James Brown and Malcom X, and Alejandro Toledo (President of Peru) all shined shoes before achieving prominence. – Charles Dickens, at age twelve, worked in a London, England shoe polish factory. – Kiwi-brand shoe polish is named for New Zealand’s national bird. – Shoeshiners in film: “Boot Polish” (1954), “El Bolero de Raquel” (1956), “Shoeshine” (1946) and of course “Underdog,” the television cartoon series.